Fall is the time for comfort foods—and what is more comforting than crusty bread slathered in melted cheese? Owning a fondue pot is both convenient and wonderful, but not all of us have the luxury of space for nonessential kitchen appliances. However, there are plenty of ways to make an absolutely delicious, lump-free fondue without the traditional equipment. For a foolproof fondue ingredient ratio, I turn to the ever-trusted America's Test Kitchen. The specifics will vary based on your favorite cheeses, but the traditional choice is Swiss (Emmental, Gruyère, or a mix of both). The wine is more than a delicious and boozy addition—its acidity keeps proteins from denaturing, or breaking up. This ensures that the cheese doesn't become stringy or becomes a solid, blobby mess. 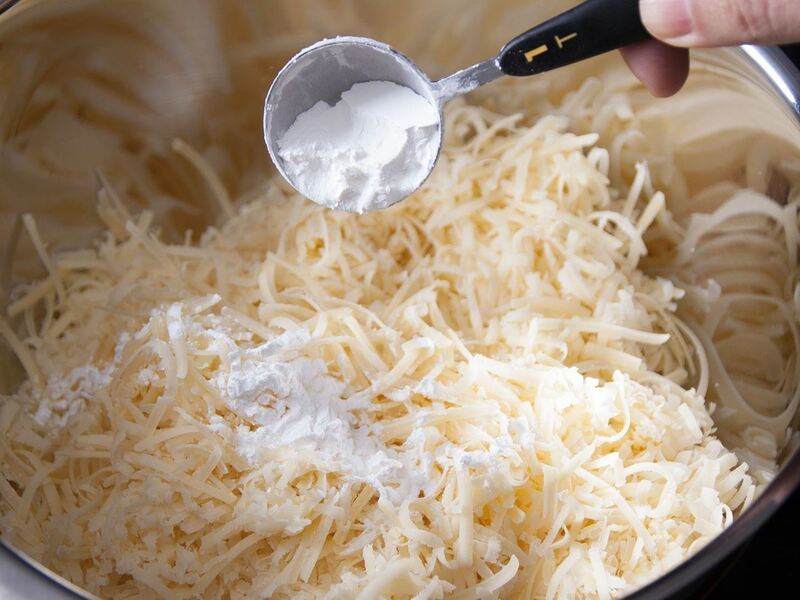 The cornstarch is additional protection for protein structures in the cheese: it ensures a smooth result without adding any additional flavor. 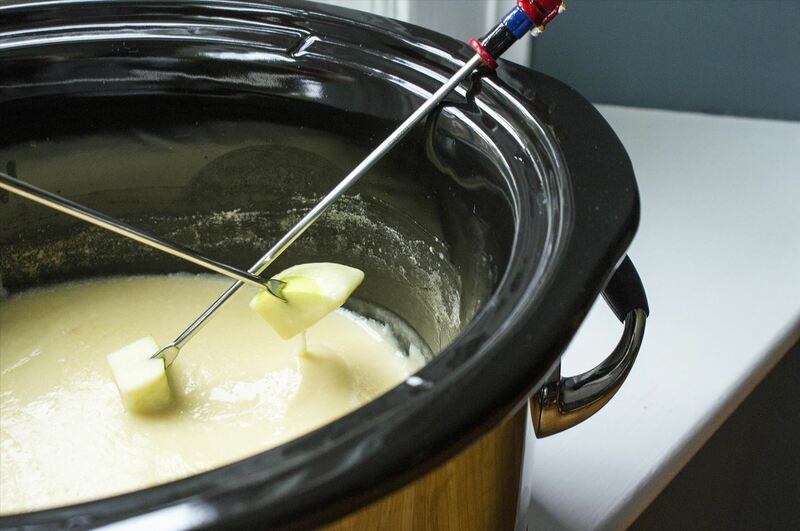 For more detailed information on the science of fondue, check out this Serious Eats article. 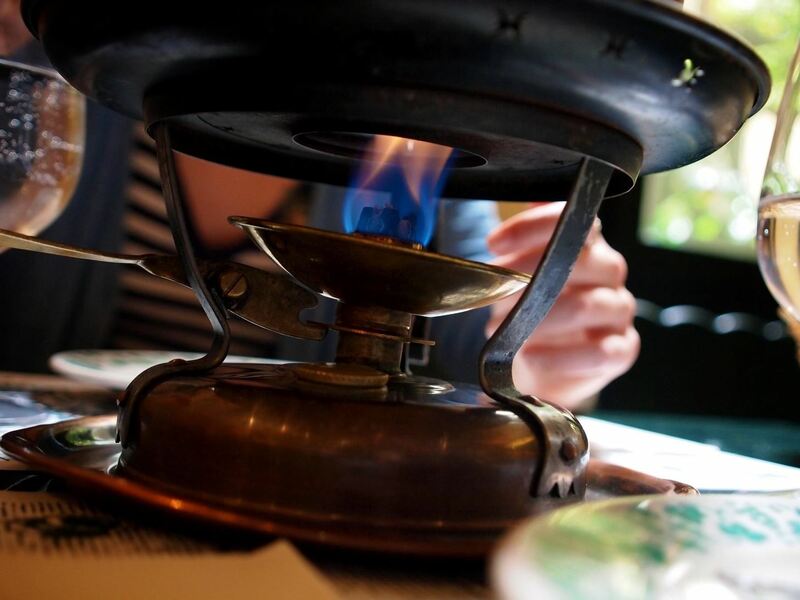 The final element of a perfect fondue is the proper heat source, and that's where we come in. 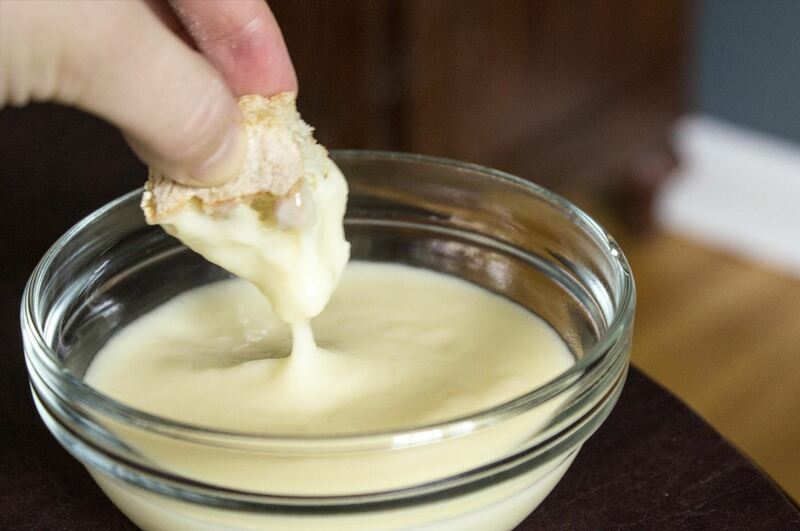 Regardless of the method you choose in making fondue, the key is gentle heat. A traditional fondue pot (aka a caquelon) is often heated by the tiny flame of a tea light. Anything stronger provides several dangers: burning the cheese, causing the cheese to seize up and therefore not emulsify with the wine, and shocking the proteins into breaking up and causing lumps. And so, the variations that extend beyond a traditional fondue pot all reflect the same gentle heat. The very nature of crockpot cooking is low and slow. Simply chuck all of your ingredients into the crockpot, turn the heat on high, and cover for an hour and a half. Stir every fifteen minutes or so, and retrieve the garlic clove after the first stir. The last several minutes should be uncovered to allow any excess moisture to escape. The double boiler provides heat in a way most similar to an actual fondue pot. 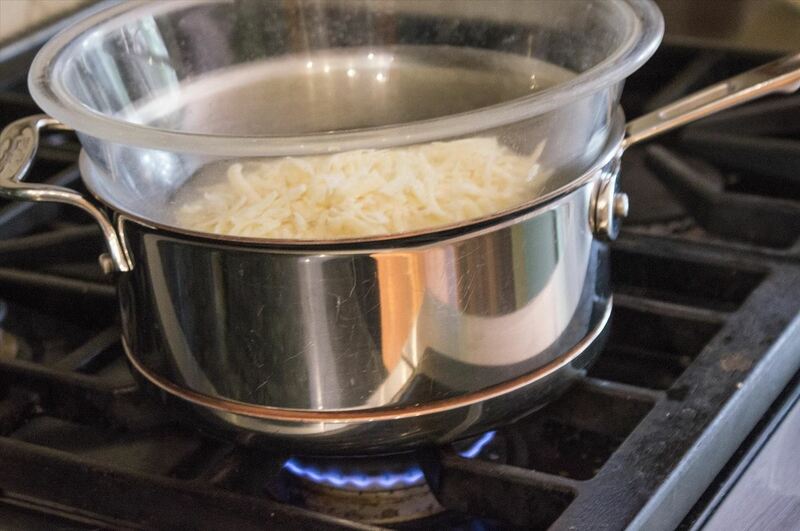 The simmering water in the pot indirectly heats the rounded bowl, allowing for a very gradual melting process. Add the wine and garlic first, then stir constantly and add the cheese in a handful at a time. The stirring eliminates lumps after each addition. As long as your flame is burning very, very low, this is the quickest method for making fondue. As with the double boiler method, add the wine and garlic first, then add the cheese in batches, stirring out the lumps in each case. Using a thick-based pot actually produced the best and most foolproof results for me compared to the other methods. 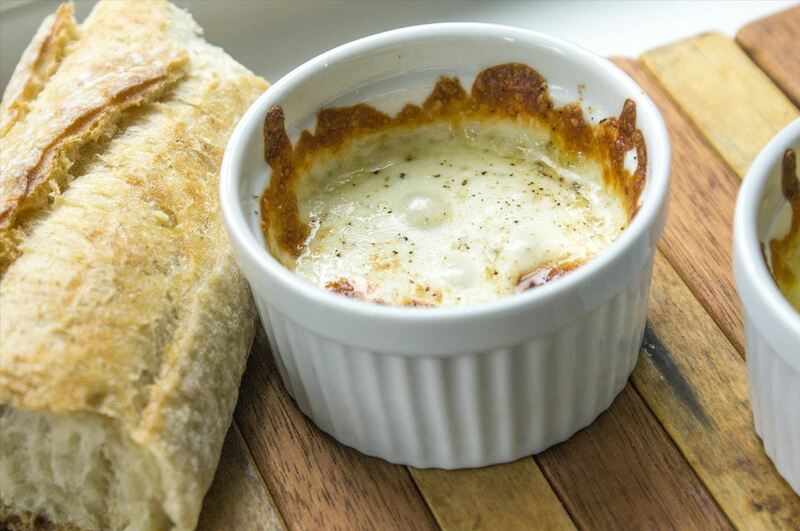 For a more immediate melted cheese fix, the opposite heat rule applies: quick and direct heat can be used, but these dishes must be eaten immediately. 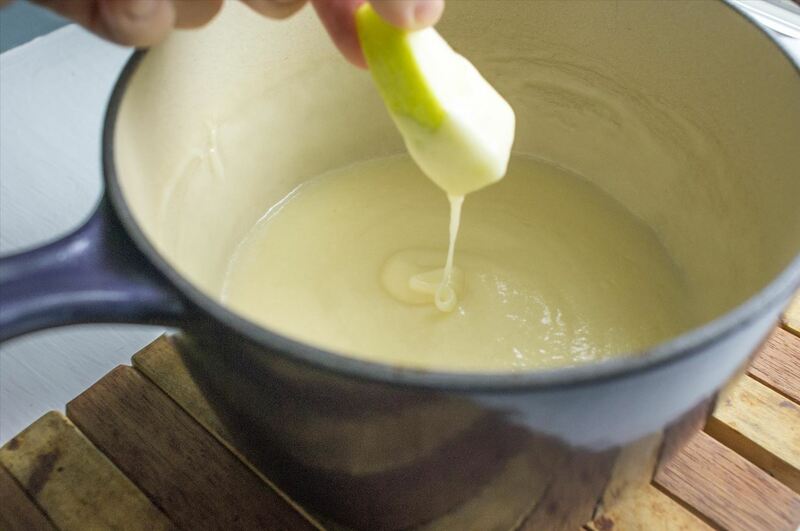 However, using this method creates a baked cheese dip and not fondue, as it doesn't involve the emulsification of cheese and wine. 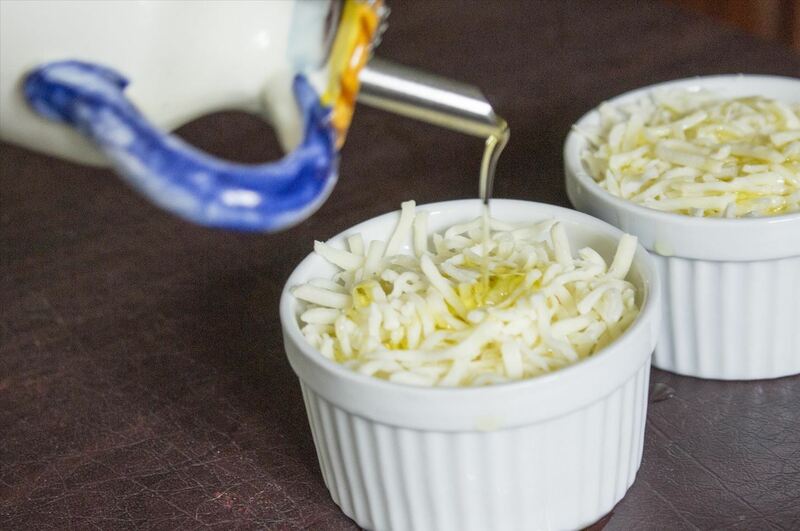 Pile grated mozzarella and Parmesan cheese into ramekins with salt and pepper, then drizzle the tops with olive oil. After that, pop them under the broiler for 4-5 minutes and serve them immediately with crusty bread. Ina Garten does a variation with Fontina in a gratin dish—also melted quickly under a broiler and ready in minutes. For any of these methods, any number of variations could be your perfect, custom-made variation. Pick a different cheese, such as sharp cheddar, and substitute the wine for beer: now you have the perfect game day dip. An Asiago fondue could pair perfectly with a Caesar salad on the side for an Italian twist on classic French flavor. But for me, the classic Gruyère paired with dry white wine is the ideal fondue flavor for a cold weather treat. Do you have any favorite combinations of cheese and beer or wine for fondue? Share your expert recipes in the comments section below.